Only a few Institutions in Europe can praise to be such an important chapter of the European culture like the University of Coimbra, and its unique philosophical tradition, already started in the Middle Ages, is still nowadays a crucial passage to understand the entire History of Philosophy. 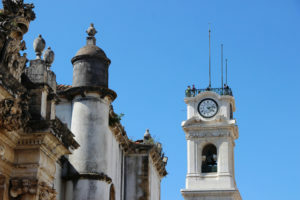 In the broad philosophical tradition of Coimbra, the Conimbricenses.org project is meant to deal with a specific chronological span of 250 years, that is from 1542 — the year of the Jesuit foundation of the College of Arts in the city — to 1772, that is the year in which the Marquis of Pombal approved a new statute of the University, addressing its activities towards other directions. These coordinates reflect hence a specific research aim, that is focusing on those years in which Coimbra has been a prominent center of the European Aristotelianism, while its influence has travelled in the world pushed by the multiple editions of the famous Curso Conimbricense and when the city hosted the teaching and the heritage of some of the most influent thinkers of the world: Luis Molina, Pedro da Fonseca, Francisco Suárez and many others. Regarding the concrete aim of the Conimbricenses.org project, it is to build the first online, fully open access digital repository on Coimbra and its tradition. Therefore, the core of the website www.conimbricenses.org, led by an international Scientific Board, including some of the most important experts in the History of Renaissance Aristotelianism, will be a complete peer-reviewed encyclopedia, entirely dedicated to the thought of more or less famous characters connected to Coimbra and to its fortune worldwide. The double purpose that leads the building of this encyclopedia is, on one hand, to let scholars from all the world access clear and univocal information, and, on the other hand, to inspire research on smaller authors, giving to the researchers an opportunity to meet them and their works. This is why all the entries will be written in English and they will be from the beginning realized by an international community of researchers, from Portugal, Spain, Italy, France, United States and many other countries. The Conimbricenses.org encyclopedia will be organized into four main sections: the first one is completely devoted to authors and scholars who lived and thought in Coimbra, with a particular focus on Luis Molina, Pedro da Fonseca, and Manuel de Góis, as well as on the editorial history of the fortunate Curso; a second section will be instead fully dedicated to Francisco Suárez, his life, his thought and his cultural heritage in Portugal and Europe; a third section, that will be launched in a second phase, will be realized with the help of scholars in the field of Chinese culture, and it will deal with the history of the Curso in China (including attempts of translation and adaptation); a fourth section will be devoted to the influence of Coimbra’s Aristotelianism on the Portuguese and Spanish colonies in South America. Finally, a specific attention will be recognized to the educational aspects of the Jesuits’ activity in Coimbra, focusing especially on educational practice, the relationship between education and publishing, the relationship between education and architecture.